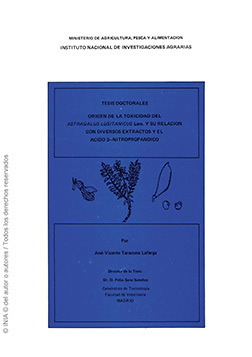 This doctoral thesis studies the origin of the toxicity of Astragalus lusitanicus Lam. using five different procedures for theextraction and purification. Toxicity tests are made of certain compounds previously isolated in the plant and of the presence of nitroalifáticos compounds. Some aspects related to the 3-nitropropanoic acid, responsible for toxicity caused by the nitrotoxic Astragalus spp, are also analyzed.